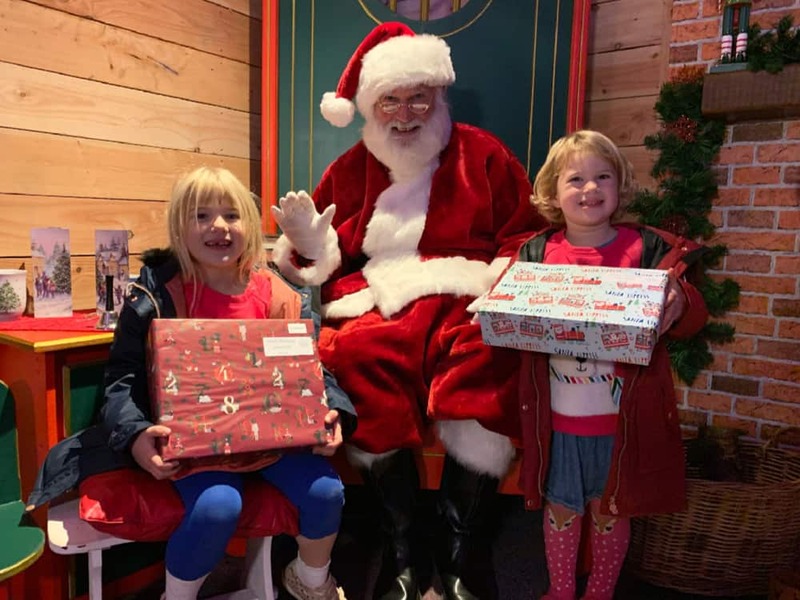 December 2018 was our second time visiting Santa’s Grotto at Woodlands Theme Park and we think it was even more magical than in 2017. We were invited to a preview the grotto and meet Santa before the festive Devon attraction opened to visitors. Here’s what you can expect, including a video of our grotto tour. Woodlands is a family attraction including indoor and outdoor thrill rides and play in South Devon. It’s one of our top things to do in Dartmouth with kids come rain or shine. Each school holidays there are additional themed activities for families including a truly spectacular Santa’s Grotto in 2017 and 2018. Are the gifts from Santa value for money? Before I go any further I should let you know that Woodland’s Santa’s Grotto is already a sell out in 2018 – even more reason to book early in 2019! If you have tickets already then you will love it. We think it’s the best Santa’s Grotto in Devon – we’ve certainly not experienced one better. Here’s where you can see our review of Woodland’s Santa’s Grotto in 2017. If you’d prefer not to have any spoilers then you might like to skip over my video which gives you a tantalising taster of what the grotto’s nine rooms and Santa experience looks like. PS Do come back an take a look another time! If you’d like more ideas for things to do this Christmas, then I have festive day out round ups for Christmas in Devon, Christmas in Cornwall and the rest of the UK. This year we are properly in the Christmas zone. Five-year-old Tot knows exactly what it’s all about and three-year-old Baby is hot on her heels. As soon as arrived at Woodlands the girls heard the festive music and spotted thousands of fairy lights glistening through the bushes at the entrance. There was no stopping them – they fearlessly went off in pursuit of Santa. The walk towards the grotto takes you down a tree and light lined footpath where you are caught in a flurry of snow (foam). This entrance to the grotto is just one of the aspects that Woodlands have upgraded to make the whole Santa experience feel slicker this year. Our elf guide Chip greeted us at the grotto entrance, checked our special grotto tickets and began our tour. The girls didn’t even look back to see if Mr Tin Box and I were following! Woodlands have included many of the features that made their first walk-through grotto such a success last year and fine tuned others. Favourite features that have made a come back include the elf tunnel, the singing reindeer, Santa’s post room and the elves bedroom. New for visitors, in addition to much more snow and many more lights, are more animated woodland animals and interactive features in the toy workshop. You can see more of these in my video as the lighting was a bit difficult for still photos. When we reached the grotto finale we were met by a dancing Mrs Claus who invited us into a toasty warm room. Santa was there, sat by a fireplace. We had a lovely chat with the Big Man before he decided to check his ‘Naughty’ and Nice’ lists to make sure the girls deserved a gift. After a bit of comedy wavering, we decided they’d probably been good enough. Each child gets age specific wrapped gift. Three-year-old Baby received a farmyard jigsaw puzzle and five-year-old Tot received a glow in the dark magic set. Both were probably worth more than £8 each based on Amazon prices. Even without the larger grotto I’d not have been disappointed with the value of entry to Woodlands Theme Park and meeting Santa. Also included in the grotto ticket price are a cookie for the child and hot drinks for the adults. At the end of the grotto experience you have the opportunity to buy a framed souvenir picture of your meeting with Santa for £7 or two photos for £12. You can also take plenty of your own photos in the grotto. Woodlands annual pass holders can enter the park for free during its open days in December but have to buy/book tickets for the grotto. See the website for full details. Tickets must be bought at least 24 hours in advance and if 2018 is anything to go by then buy them as soon as they go on sale. Up to two adults can accompany a child in the grotto. See the Woodlands website for advice on booking if there are more than two adults in your group. Some of the Park’s attractions are closed for the winter but there’s still plenty going on to fill your day. Find out more about special events and prices for Woodlands Family Theme Park by visiting its website. Disclosure: we were invited to see Woodlands Theme Park’s Santa’s Grotto for free and were not paid for promotion. All opinions are my own. Thinking of visiting the Woodlands Theme Park Santa’s Grotto next year? Why not pin this for later?